The other day, a prominent Los Angeles Times writer whom I very much respect confessed something rather startling to me: that he finds himself in the strange position of actively wishing for David Geffen to buy the newspaper. Perhaps more LAT staffers feel the same way, since the paper keeps dwelling on Geffen’s interest in Spring Street in its pages. For instance, here’s more news about Geffen and the Los Angeles Times — from the Times itself. In a story about a Tribune Co. investor who “could be pivotal” in the future of the company, Ariel Capital, and its big kahuna, John W. Rogers Jr. (photo below), the story’s headline could have gone a lot of ways. But it chose to emphasize Rogers’ connection to David Geffen, even though that isn’t even mentioned until the 7th paragraph, and even then it’s described as “casual.” (For non-newspaper types, trust me, that’s a real headline stretch.) Here’s why: as the article itself says, “Ariel’s connections don’t stop at the Tribune boardroom. Rogers’ protegee and a fellow Princeton alum, Ariel President Mellody L. Hobson, 37, is a director of DreamWorks Animation SKG Inc., along with Geffen, the studio’s co-founder. When Hobson visits Los Angeles, she sometimes stays at Geffen’s house. Rogers called Hobson’s ties with Geffen ‘an interesting coincidence’ but cautioned against reading too much into it. As a major shareholder in a company like Tribune, we get calls from private equity firms and wealthy individuals,’ Rogers said. 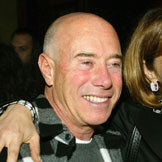 ‘It’s part of our job to engage in conversations.’ Although he shrugged off the notion that Ariel has been a conduit between Geffen or other interested parties and Tribune, Rogers said: ‘As we gain insight and information as to how people view the company, it’s important to bring those questions up’ to management. ‘We might say, ‘Have you thought of this? Have you thought of that? Here’s what one person thinks such-and-such an asset is worth. '” Ok, now it’s me again. Frankly, I’m surprised the LAT didn’t make a bigger deal of Mellody Hobson: she’s a real powerhouse in her own right. Meanwhile, news today that retired General Electric CEO Jack Welch, who once controlled NBC, is reportedly interested in buying the Boston Globe from The New York Times Co. He’s retained JP Morgan along with his partner Jack Connors. Executives who have been briefed on their plans caution they are “preliminary.’’ But let me remind everyone that even though the Globe is a liberal paper in a predominantly paper, Welch is a rabidly conservative Republican.